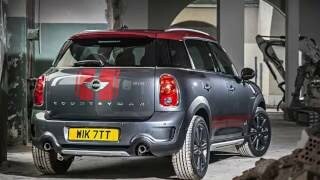 It hasn’t been long that MINI release its Clubman Vision Gran Tourismo and here it comes at the 2015 Geneva Motor show with its Countryman Special Edition, MINI Countryman Park Lane 2015. Speculated to battle with Fiat 500X and Nissan Juke, this new release is names after a London street in Mayfair district. Just to bring into the diaries of car lovers, it isn’t the first time MINI came with a Park Lane dedicated model, turning few pages in history year 1987 brings a same glory names after street and the closest one from year 2005 as well. 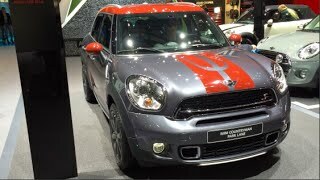 Let us have a detailed knowledge of the design and features MINI is following to make this Countryman Park Lane special Edition model a memorable treat. With the very entrance in the interior of MINI Countryman Park Lane 2015, you’ll notice ‘Park Lane’ emblems on the door sills and dashboard. Moving further to catch your attention awaits door handle surround and cockpit trim featuring Oxide Silver surface. For this model the upholstery revives the atmosphere with a cold touch as they say with fabric/leather finish called Parallel Lines Light Tobacco. There are also certain features that come standard with any trim or color you go for like, automatic air conditioning, velour floor mats, storage and lightning package, rain and light sensors and an on-board computer. Apart from these a multi function sports steering wheel houses over the old black plastic covered dashboard. 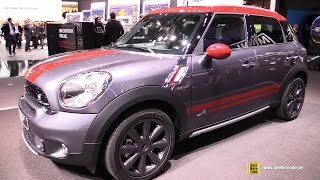 Exterior of MINI Countryman Park Lane 2015 comes with a dual-tone paint which commendably will grab eye balls of people around while you are driving it down the lane. Holding the ‘Earl Grey metallic ‘ finish the base model gets distinctively adored with Oak Red paint featuring racing stripes, roof, exterior mirror caps, lower door sections and indicator surrounds. Also coming standard with all models is the MINI ALL4 Exterior visual package that brings with it silver designed motifs for both the aprons and side sills. 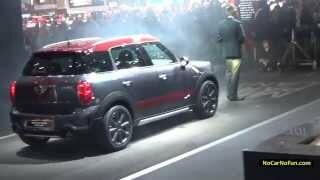 Just like interior, exterior of MINI Countryman Park Lane 2015 too gets ‘Park Lane’ Emblems below the turn signals. Exterior no doubts is a catchy revised work and thus the model is expected to gain a few extra customers in market. Engine beneath the hood of MINI Countryman Park Lane 2015 depends upon the market; it can come up with any of its four engines available with ALL4 AWD or FWD system. The queue carries the least is a 1.6 Liter four-cylinder delivering 121 hp and 160 nm torque while the one listed on top is a 1.6 Liter four-cylinder delivering 181 hp and 260 nm torque. Both of these listed engines can be mated to either a six-speed manual or six-speed automatic transmission. Stepping towards the diesel engines range is a 1.6 Liter four-cylinder with an output of 111 hp and 270 nm torque.